Having a villa in Bali requires a few things to keep it safe, proper and nice. If you buy a villa in our main project (Royal Residence Rangdu RRR) we offer you the following services provided by the staff of RRR. special services like tax-payment, villa insurance, rental license etc. Our fee depends on the size of your property and in average will sum up to amounts between € 250 and € 300 per month (including unlimited water supply from a pure mountain spring). If you have your villa built by us elsewhere we can also organise these services for you. 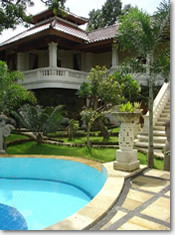 In either of these cases our aim is to give you peace of mind about having a nice villa in Bali.